Debt is part of modern life. It can be used to help you reach your goals, but only when you are in control of it, not when it is in control of you. In 2016, Chapman Welsh Financial Services are looking to provide a debt management service to our clients to complement the holistic advice approach we have built in recent times. How can I be smarter with my credit card? What is the benefit of starting now? Review your spending patterns, financial commitments and debts. Help you set specific goals and target timeframes to achieve them. Look at how much you'll need for long-term goals. Help identify ways to pay off your home loan sooner. Recommend savings or investment strategies to achieve your goals. Most of us have things we want but not everyone can simply go out and buy them. Whether it's a new car, an overseas trip or a deposit for your first home, that something special is achievable if you are realistic and put in place a disciplined savings program. Recommend savings or investment strategies to achieve your goal. At CWJA Finance Solutions we have a 'big picture' approach to your financial management and wealth creation. No matter what reason for seeking finance, our lending team will ensure that we understand your situation and needs in order to source the right loan for you. If you are looking to buy an owner occupied house, we can help find the best loan for you, fast. If you need a loan for construction, we will help you choose a loan that gives you the flexibility and features your require both during and after the construction period. Our lending team will review your current saituation and ensure that your loan meets the best of what is currently on offer in the market, tailored to your specific needs. We can assist you with debt consolidation to tidy up your current situation and reduce servicing costs. All mortgage brokers use a variety of lenders, and have to undergo a process of accreditation to offer a product on behalf of a lender. This ensures that you are always offered a variety of products, from our panel of over 25 lenders. In many cases, borrowers accept the cheapest rate offered to them. However, over the long term, this is not always the best deal for your situation. Our mortgage consultant takes time to understand your long term aspirations and plans, and ensure your loan is in line with these. We recieve our fee from the lender, not the borrower. This fee is full disclosed to you. Therefore our service is at no extra cost to you. A self-managed super fund (SMSF) is a trust structure that can be used to manage retirement savings on behalf of its members. SMSFs are established for the sole purpose of providing financial benefits to its members in retirement, the benefits can also be passed to beneficiaries upon death. 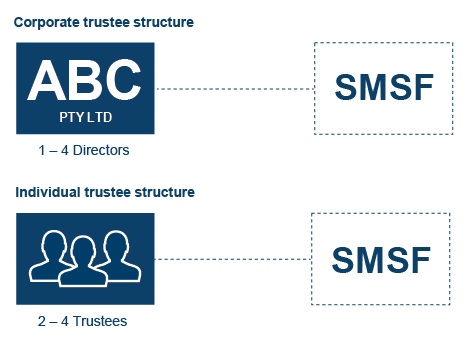 Individual trustee structure – each member of the fund is appointed as a trustee of the fund and you must have a minimum of 2 trustees. The main advantage of an individual trustee structure is it is cheaper to set up. Once your SMSF is established, the first thing you will need to do is set up a transactional bank account. Generally, SMSF trustees will use one central bank account to receive contributions and rollovers, and then use that account to make investments or pay out pensions where applicable. Wealth protection strategies refer to personal insurances that provide you with peace of mind if you were to fall on financial hardship via injury or illness. A person’s greatest asset is their ability to earn an income. If you were unable to work for an extended period of time due to illness or injury, would you have enough funds to cover day-to-day living expenses for a few weeks, months, or even years? Income protection insurance is a type of insurance that allows you to cover up to 75% (sometimes 80% with various companies) of your taxable income for your household while you are sick or injured. Depending on your occupation, income, duties, and specific needs, the different types of Income Protection policies can vary greatly from provider to provider. It is therefore vital that you seek the advice of a Chapman Welsh Financial Services specialist to help you assess your needs and find the best insurance cover that’s right for you. We can help you choose the best type of insurance for your needs and budget, and have access to a variety of insurance companies with a range of cover options. What would happen if you died or became terminally ill? Do you have a plan in place that would provide for your surviving family and loved ones? Would it provide enough to cover final expenses, any mortgage or other debts, education expenses as well as enough to cover regular living expenses? No amount of money can begin to cover the hurt of losing a loved one, but it’s important to understand the need to provide for people who depend on you financially if you were to pass away. At Chapman Welsh, we use the “3 cheque approach” with our clients when working out a relevant sum insured for Life Insurance. By providing cover for the above, it takes away the financial stress and burden for surviving spouses and family members, leaving them with one less thing to worry about in times of sadness and loss. Everyone seems to know the numbers behind serious illness and injury, but everyone manages to have an optimistic view that "it won't happen to me". Trauma insurance pays a lump sum for a specified illness or injury, this lump sum not only helps with the medical costs associated with the illness or injury but helps finance day-to-day expenses for you and your family. Depending on the level of trauma insurance you have in place depends if the specified illness or injury you have suffered is covered. Standard trauma cover generally includes cancer, heart attack and stroke. Speak to the advisory team at Chapman Welsh Financial Services to ensure that your trauma insurance needs are met to remove the financial stress if an unexpected illness or injury was to occur. TPD insurance is a lump sum payed to someone if they become totally permanently disabled to assist with the payment of rehabilitation and living expenses. TPD is partnered with death cover and is paid via the owners superannuation fund. The sooner you begin to plan for your retirement, the sooner you can see if you are on track. At Chapman Welsh Financial Services we look at different opportunities for you to maximise your savings while you are earning an income, and ensure you achieve the retirement you dream of. On the other hand, if you've independently funded your retirement, you may benefit from keeping track of, or restructuring, your finances so you can maximise any government entitlement.